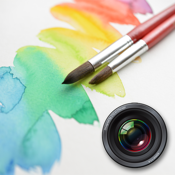 This app converts photos taken using your iPhone/iPad or images loaded from your library into high-quality watercolors. Recreates the roughness of paper. Optimizes photos with lots of detailed and complicated shapes such as leaves on trees and flowers.